This example assumes basic familiarity with Jama’s REST API and making REST calls. In the “meta” object of every collection response is an object called “pageInfo”. This object contains all the information you need to move through the rest of the data you’re looking for. • “startIndex” is the index of the first result. • “resultCount” is the number of results retrieved in this request. • “totalResults” is the total number of values that this request matches. Using these three values, you can consume the rest of the results. List the names of all of your projects using Python and the Requests library. This example omits any error checking. First, import the Requests library (http://www.python-requests.org) to simplify the example. 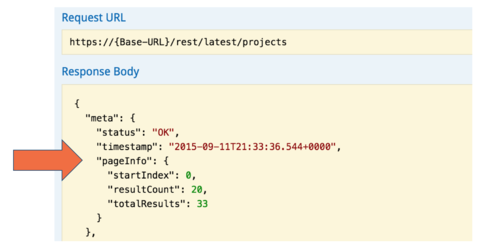 Import json as well, so you can easily access the results of the requests you’ll be making. Set aside some strings that you’ll use later in your request. Separate the base URL from the name of the resource so you can reuse the base URL elsewhere in code. It’s also a good idea to store your API_User’s password somewhere other than the source code. Next, establish how many results you’ll accept from the Jama REST API with each request. You’ll need the int to advance through pages of results and the string to send as a parameter to the GET request. For this example limit the results to 10. The variables result_count and start_index mirror the names of the values in the “pageInfo” object. result_count is your loop control, and start_index is your current position in the results paging. The start_at string is a parameter to your GET request which allows you to start your results at any index. The ‘?’ indicates the start of a list of parameters which are separated by the ‘&’. Make the GET request and load the results as json. Pull out the “pageInfo” object so you can update your start_index and result_count variables. Now you can get down to business. Iterate over all the returned projects and display their names. If the Jama REST API receives a startAt= parameter which is greater than or equal to total_results it sends back a “resultCount” value of zero. When that happens, you know you’ve consumed all the results which match your request.